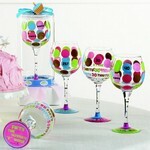 We are your complete source for all new Monogrammed gifts. What a great idea for Christmas gifts, Teacher gifts, students, co-workers, family and friend gifts. New Mainstreet MSC monogrammed clipboards, monogrammed journals, monogrammed pens, and monogrammed ID holders are all available. All new designs include the black and white striped monogrammed journal, and monogrammed clipboards. Black and white polka dot monogrammed ID holders are perfect for nurses and teachers. Our monogrammed burlap table runners are still one of our best selling monogrammed gifts. They are back, all new Monogrammed Clipboards by MSC. Choose from black striped monogrammed clipboards with gold initial or black and white polka dot monogrammed clipboards with gold initial. Monogrammed clipboards are the perfect gift for teachers, co-workers, students, friends and relatives. Be sure to grab yourself a monogrammed clipboard. 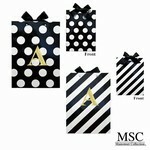 New to our category of monogrammed gifts is the black and white design by MSC Mainstreet, monogrammed ID Badge Holders. 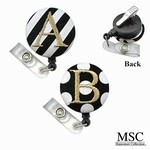 Choose striped black and white or polka dot monogrammed ID Badge holder. 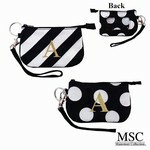 Monogrammed ID pouches by Mainstreet MSC are back with new designs. 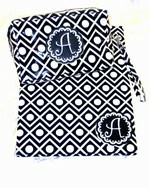 Black and white stripes or polka dots with gold monogrammed initial. Our best selling Monogrammed Journals are perfect for students, co-workers, girlfriend gifts, teacher gifts and especially yourself. New Mainstreet monogrammed journals are available in two designs each in black and white with a gold initial. 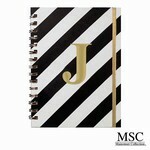 Monogrammed journals designs include black and white polka dot and black and white striped monogrammed journals by MSC. 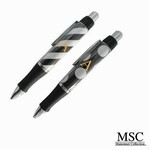 Mainstreet MSC new monogrammed pens come in black and white stripes or polka dot. Smooth and clean monogrammed writing pens, these are the perfect monogrammed gifts for friends and family. We bring you again, your place to shop for Christmas 2015. All new Gold Strip burlap initial Christmas Stockings, Monogrammed burlap table runners, Holiday Peace and Joy pillow, new Christmas 2015 Pajamas for the whole family, Chalkboard burlap stockings, elegant and pretty gold and black tunic dresses with matching tights for the sweet little girls, new Mud Pie polka dot casual palazzo pants, Celebrate burlap wine bags, and so much more. Oh, how cute are these new toddler Christmas boxer shorts? 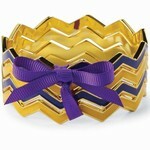 In holiday designs, cotton and with an elastic waist, these cannot be passed up this holiday season. Great gifts. Your french knot linen towels have arrived and are ready to decorate your home for the holidays. 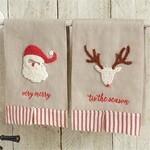 Red Burlap, Santa, Snowman, Reindeer and Christmas Tree Linen Towels. All are adorned with something special. Burlap bows, ornaments, 2 for 1 red sets, and of course we didn't forget the monogrammed initial ornament linen towels and the Glitter towels. Christmas pajamas for the whole family! NEW, comfy reindeer pajama tops. Decorate your home with the Burlap Christmas Pillows. Choose from JOY or MERRY. 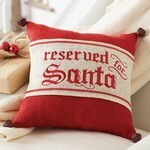 Red burlap pillows embellished with jingle bells and you choose your holiday decorative wrap such as Merry Christmas, Santa, or monogrammed initial. Use your pillow everyday after the holidays. Plain burlap pillows available also. The best source for your Christmas Stocking shopping. New Burlap Stockings, Polka Dot Christmas Stockings, Pom Pom Stockings and Monogrammed Initial Stockings. Come take a peak and let us know if you have any questions about our fabulous selection of Christmas Stockings. 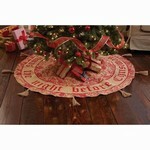 Christmas tree skirts enhance and make your tree the center of the room. NEW fall and winter Maxi Skirts for work, everyday, or that short shopping trip. Maxi Skirts are comfy and stylish with just the right blend of how fabulous you look. All new print Maxi Skirts, polka dots and stripes will make you the talk of your friends of how you dress so fashionabily. Check out our New Palazzo Pants. Wine bags are great for those Holiday parties. 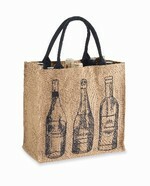 Your party hostess will love these new red and burlap wine bags with seasonal message on each one. 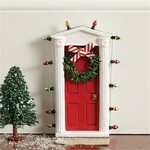 Elf Door by Mud Pie for children to make believe. Christmas Dresses, Christmas onesie with bow tie, and tunic and tights are just a few of the new additions from Mud Pie Christmas 2015. Dressed in Red, green, blue, gold and black are certain to make your little person the adorable and fashionable child this Christmas. Personalize your Christmas this year with a Monogrammed Christmas Stocking. 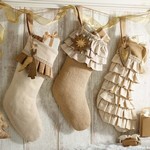 Choose from Burlap, Chalkboard, or initial ornament stockings. Red and White black chalkboard Christmas Stockings, Red Initial Ornament Stockings, or the gorgeous Glitter Ornament Christmas Stockings. New Christmas Stockings this year are the Glitter Initial Burlap Stockings, Chalkboard Burlap Stockings, Red Initial Burlap Stockings and Ornament Burlap Stockings consisting of an Angel, Star, and Reindeer. Matching Glitter and Red ornaments or your Christmas Tree ornament decor are also available. Check Out Our Special Savings each week. New for Spring, the Todder and Baby Tunic sets. Great price $28.00. Mud Pie Baby introduces the new ruffled leg tunics. Stephen Joseph Backpacks, College bound student portfolios, Dorm Room and Sorority Decor, Fashion Handbags and Flat Wallets are a few of the most wanted items this school year. Come on in and take a peak around. You are sure to find many great new looks for this year. 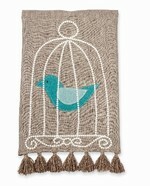 You have been searching and searching some more for the ever so popular, Burlap Home Décor. Its right here! Burlap Christmas Stockings, Burlap Table Runners, Burlap Christmas Linen Towels, Burlap Wine Bags, Burlap Initial Christmas Stockings, Burlap Chalkboard Christmas Stockings and all new for Christmas, Burlap Red Wood picture frames. For everyday, vacations, parties, showers and after work fun, these can go anywhere. The new wallet design for 2013, is the Clutch Flat Wallet. Styles include the accordian or the opens flat. 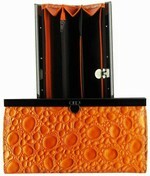 11 Credit card Slots, Zippered pouch, window for photo ID and checkbook area. Flat Wallets are for everyone. Clutch Flat Wallets, New Monogrammed wallets, Patchwork Flat Wallets, Metallic Wallets, and Black and White Polka Dot Flat Wallets. Every Flat Wallet has 5 credit card holders, a window for picture ID, zipper coin purse and many additional pockets for receipts and pictures. The small flat wallets feature window for photo ID, 3 credit card holders, and additional pockets for any extras. This is the perfect size to throw in your pocket. See all of our new straw and vegan leather clutches and handbags! Sun Hats, Straw Hats and all kinds of Hats for Summer in the sun! Burlap Home Decor, Burlap Plaques, and Burlap Wooden Picture frames with new designs and colors for this years new season. These very cute Lace Shorts are available in both Black and White and adourned with silk tie. NEW mini flat wallets arrive each week. Great for your small handbags or fits perfect in your jean pocket. Monogrammed Portfolios are perfect for school, college, teacher's gift and executive gifts. Now 3 different styles to choose from. Mainstreets Monogrammed Portfolios come in the Polka dot style or the all new for Fall, the Solid Black, Pink or Lime green. These monogrammed clipboards make great gifts for student, college students, teachers, professionals and mom for Mother's Day. We have put together a category of our very best sellers to help you choose something special. New by Mud Pie Gifts are their very momento picture frames. Best Mom Frame, Best Grandma, Grandma's Angel and our Customer's Favorite Mom's Best Friend. Some of our mothers favorite gifts throughout the years, is a Mother's Day Gifts of pictures of their loving family. Another great idea this year, is the Monogrammed Apron. So cute and so Mom!! We are your complete source for Mud Pie Baby. New collections for Spring and Summer and we have the perfect baby shower gifts! Mud Pie's new Bag Lady Collection is the hottest tunics, totes and floppy hats right now. So much new for Beach, poolside and resort wear. Mud Pie introduces new Chevron styles of cover ups, totes and striped handbags. Just what you have been asking for, all new Lined Lace shorts in black and white. New Striped black and whites swimsuit cover ups and accessories. We are going to the Beach! Oh what to wear? Chevron Swimsuit Cover ups, Lace Swimsuit Cover Ups, Black and white Striped Cover Ups, Halter or One Should Cover Ups. So much to choose from this year. All new Mud Pie Gifts for 2009 include the monogrammed mini flat wallet, monogrammed cosmetic bag, bridesmaids and groomsmen gifts includes the bride koozie, groom koozie, groomsmen koozies and bridesmaids koozies. The bridesmaids wine glassess are great bridesmaids gifts and if your looking for something special for the bride, the bride wine glass in blue is a gift she will cherish for a lifetime. Mud Pie Children Collection now includes toddler sizes up to 5T. As with all of Mud Pie, the new Fall and Holiday collections will make your child asking you where do you get those cute clothes. New arrivals every week. Flat Wallets, Monogrammed Gifts, Mud Pie Baby, Mainstreet gifts, MSC monogrammed gifts and bridesmaid gifts. Resort Wear by Mud Pie comes in Swimsuit Cover Ups, Chevron Maxi Dresses, Black and White Striped Dresses and accessories and the ever popular and best selling Marilyn Sun Hat. 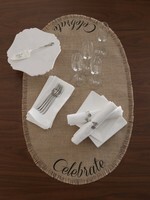 New Holiday Table Runners and everyday Burlap table runners have arrived. Monogrammed Table Runners will make a beautiful addition to your festive Holiday season as your tabletop home decor table runners elegantly decorate your holiday dinner table. Compliment your burlap home decor with the new Burlap Initial Christmas Stockings. We have something for all teachers. NEW for This year, are the Monogrammable Jute Totes. Monogrammed totes are our #1 best seller for teachers. They can carry everything in these, from papers to lunch. They love the Travel Tumblers and be sure to check out the Christmas travel tumblers for that special teacher's gift. 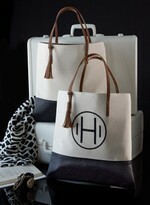 NEW spring and summer designs and colors in Totes. 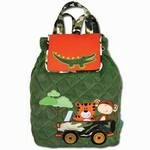 Need a new beach tote, baby tote or school tote, come in and see whats new.